D.M. Aderibigbe was born in Lagos, Nigeria, and holds a BA in History and Strategic Studies from University of Lagos in 2014. His chapbook, In Praise of Our Absent Father, is an APBF New Generation African Poets Chapbook Series selection. He has received 2015 and 2016 fellowships and honors from Oristaglio Family Foundation, Entrekin Foundation, Dickinson House, Callaloo, and Boston University, where he is currently an MFA candidate in creative writing. His poems appear widely in literary journals. Eloisa Amezcua is an Arizona native. Her poetry and translations have been published or are forthcoming from BOAAT, Tahoma Literary Review, Pittsburgh Poetry Review, and others. Her chapbook, On Not Screaming, is forthcoming from Horse Less Press. Bonnie Auslander is a poet, essayist, and radio commentator from Washington, D.C. Her poems have appeared in FIELD, Poet Lore, Gargoyle, and elsewhere, and she recently took first place in the Society for Humanistic Anthropology poetry competition. Kristin George Bagdanov is a PhD student in literature at U.C. Davis. She earned her MFA in poetry at Colorado State University and has poems in The Cincinnati Review, Berkeley Poetry Review, The Laurel Review, and other journals. Tara Ballard was born and raised in Alaska. For six years now, she and her husband have been living in the Middle East and West Africa, teaching English in local area schools. She holds an MFA from the University of Alaska, Anchorage. Her poems have been published in or recently accepted by The Southampton Review, Chiron Review, The McNeese Review, War, Literature & the Arts, and other literary magazines. Damon Barta once lived in a place where he could see for miles in every direction. He now lives safely among trees. His work has appeared in several print and online journals. Michael Bazzett’s work has appeared in Ploughshares, Massachusetts Review, The Sun, and Oxford Poetry. His debut collection, You Must Remember This, (Milkweed Editions, 2014) won the Lindquist & Vennum Prize for Poetry, and his verse translation of the Mayan creation epic, The Popol Vuh, is forthcoming from Milkweed in 2017. Dan Beachy-Quick is a poet, essayist, and writer of exploratory prose. His most recent book is gentlessness. He teaches in the MFA Program at Colorado State University, and is currently a Guggenheim Fellow. Jeffrey P. Beck’s poetry has been published in Miramar, River Styx, Worcester Review, Naugatuck River Review, I-70 Review, Cold Mountain Review, and other journals. The author and editor of four books of prose, he is working on his first book of poetry. He recently won first place in Barely South Review’s 2015 Norton Girault Prize for poetry. Francesca Bell’s poems appear in B O D Y Literature, River Styx, Spillway, Tar River Poetry, and other journals. She won the 2014 Neil Postman Award from Rattle. Her translations from Arabic appear in Berkeley Poetry Review, Circumference, and Laghoo. Sierra Brown is a poet in the University of Michigan Helen Zell Writers’ Program. She is an intern at Michigan Quarterly Review, a Devil at Wolverine Press, and a reader for Canarium Books. A poem of hers appeared in Blue Mesa Review. Caylin Capra-Thomas's second chapbook, Inside my Electric City, is forthcoming from YesYes Books. Her poems have appeared or will soon in journals such as Crazyhorse, Willow Springs, The Journal, Ninth Letter, and Salt Hill. She lives in Missoula, Montana. Maria Isabelle Carlos is a poet from Columbia, MO. Her work has appeared in The Collagist, Cellar Door, and was a prizewinner in the Independent Weekly's Poetry Contest. She currently lives in New Orleans, LA. Barbara Siegel Carlson is the author of the poetry collection Fire Road (Dream Horse Press, 2013) and co-translator with Ana Jelnikar of Look Back, Look Ahead, Selected Poems of Srečko Kosovel (Ugly Duckling Presse, 2010). Patricia Clark is the author of Sunday Rising (her fourth book of poetry) and a chapbook, Given the Trees. She has new work forthcoming in Prairie Schooner, Plume, Michigan Quarterly Review, and Superstition Review. She lives in Michigan and teaches at Grand Valley State University. Charlotte Covey is currently a senior studying Creative Writing and Psychology at Salisbury University in Maryland. She has poetry published or forthcoming in journals such as Slipstream, The MacGuffin, and The Summerset Review. She is co-editor-in-chief of Milk Journal. Carmen Dolling is an MFA candidate at Johns Hopkins University. She received her bachelor’s degree in English and Classical Studies from the University of Florida in 2013. She currently lives in Baltimore. Wendy Drexler’s poems appear, or will shortly, in Barrow Street, Mid-American Review, Nimrod, Prairie Schooner, and the Hudson Review. She has a book, Western Motel (2012,Turning Point). She is a poetry editor for the MA Audubon Society. Valerie Duff-Strautmann is the author of To the New World (Salmon Poetry). Recent poems have appeared in Solstice, Prague Review, and The Common. Her books reviews have been published widely and she was the 2015 Writers’ Room of Boston Fellow in poetry. Barbara Duffey is a 2015 NEA Literature Fellow in poetry. Her collection Simple Machines won the 2015 Washington Prize from The Word Works and will be published in March 2016. She is also the author of I Might Be Mistaken (Word Poetry, 2015) and an assistant professor of English at Dakota Wesleyan University. She lives in Mitchell, South Dakota, with her husband and son. Jennifer Givhan is a Mexican-American poet from the Southwestern desert. Her full-length collection Landscape with Headless Mama won the 2015 Pleiades Editors’ Prize (forthcoming 2016). Her honors include an NEA Fellowship and a PEN/Rosenthal Emerging Voices Fellowship. Mark Gosztyla studied poetry in the MFA program at the University of New Hampshire and currently teaches workshops at Tufts University. Poems of his have recently appeared in Barn Owl Review, Bodega, LUMINA, Transom, and Whiskey Island Magazine. He lives with his family in New Haven, CT.
Cary Groner’s debut novel, Exiles (Spiegel & Grau), was a Chicago Tribune “best book” of 2011. His short stories have won numerous awards and appeared in venues that include Glimmer Train, American Fiction, Mississippi Review, Southern California Review, Tampa Review, Sycamore Review, and Zymbol. He earned his MFA in 2009 from the University of Arizona and lives in the San Francisco Bay Area. Grey Held has spent 25 years in the corporate world, managing and mentoring teams and coordinating projects. He is a community activist and a recipient of a National Endowment for the Arts Fellowship in Creative Writing. Two books of his poems have been published: Two-Star General (Brick Road Poetry Press, 2012), and Spilled Milk (Word Press, 2013). Aideen Henry lives in Galway, Ireland, and works as a writer and a physician. Her debut poetry collection, Hands Moving at the Speed of Falling Snow, was published in 2010 and her most recent collection, Slow Bruise, was published in 2015, both with Salmon Poetry, Ireland. Originally from Milwaukee, Wisconsin, Nora Hickey now lives in Albuquerque, New Mexico. A graduate of Kalamazoo College and University of New Mexico, her poetry has appeared in Narrative, the Massachusetts Review, Mid-American Review, DIAGRAM, and other journals. She is member of the Dirt City writers collective. Jen Hirt is the author of the memoir Under Glass: The Girl with Thousand Christmas Trees, and the co-editor, with Erin Murphy, of Creating Nonfiction: Twenty Essays and Interviews with the Writers. She is an assistant professor at Penn State Harrisburg. Karen Holman works as a counselor in Detroit and on the staff of december magazine. Her poetry has aired on NPR and her chapbook, Welcoming in the Starry Night of the Lightning Bees, features in New Poets, Short Books, vol. IV, ed. Marvin Bell. Ishion Hutchinson was born in Port Antonio, Jamaica. He is a professor at Cornell University and the author of House of Lords and Commons: Poems (FSG, 2016). 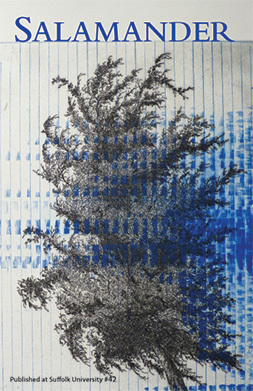 Claire Illouz is a painter and engraver who is heavily influenced by the natural world. She lives and works in Chérence, France, and her works are in various private and public collections in Europe, the U.S., and Taiwan. Her etching and artist’s books received awards from the French Academy of Fine Arts in 2012 and 2013. Emily Jaeger is co-editor/co-founder of Window Cat Press. Her poetry has appeared in Four Way Review, Soundings East, Incessant Pipe Salon, and elsewhere. Her chapbook is The Evolution of Parasites from Sibling Rivalry Press (2016). Gwendolyn Jensen began writing poems when she retired in 2001 from the presidency of Wilson College. She has two books: Birthright (Birch Brook Press, 2011), a letterpress edition now in a second printing, and As if toward Beauty (Birch Brook Press, 2015). Kasey Jueds’s poems have appeared in publications including the American Poetry Review, Beloit Poetry Journal, Crazyhorse, Prairie Schooner, Manhattan Review, Salamander, Crab Orchard Review, Women’s Review of Books, and 5AM. Keeper, her first book, won the Agnes Lynch Starrett Prize from the University of Pittsburgh Press, and was published in 2013. Judy Katz-Levine is the author of two full-length collections of poetry, When The Arms Of Our Dreams Embrace (Saru 1991) and Ocarina (Saru/Tarsier 1996). When Performers Swim, The Dice Are Cast, a chapbook, was published by Ahadada in 2009. Her poems have appeared recently in Ibbetson Street, Blue Unicorn, Gravel, Muddy River Poetry Review, Allegro Poetry (UK), and Ygdrasil. Jennifer Wisner Kelly’s stories have appeared in The Massachusetts Review, The Greensboro Review, The Madison Review, the Beloit Fiction Journal, and others. She has been awarded artist residencies by the Ucross Foundation, the Jentel Foundation, the Virginia Center for the Creative Arts, and the Kimmel Harding Nelson Center for the Arts. She lives in Concord, Massachusetts. Lynne Knight is the author of four poetry chapbooks and four full-length poetry collections. I Know, her translation with the author Ito Naga of his Je sais, appeared from Sixteen Rivers Press in 2013. Jacqueline Kolosov’s forthcoming memoir, Motherhood, and the Places Between, won the 2015 Mary Roberts Rinehart Award. Her third collection of poetry is Memory of Blue. She serves on the faculty at Texas Tech, where she directs the creative writing program. Robert J. Levy’s work has appeared in Paris Review, Poetry, Kenyon Review, Southern Review, Georgia Review, and many other magazines. He has published three books— Whistle Maker (Anhinga), In the Century of Small Gestures (Defined Providence), and All These Restless Ghosts (FutureCycle)—as well as six chapbooks, and he is a past recipient of an NEA Fellowship. Maxim Loskutoff was raised in western Montana. His stories have appeared in The Southern Review, The Gettysburg Review, Witness, Narrative, and The Chicago Tribune. He has worked as a carpenter, field organizer, and bookseller, among many other things. Heather Madden serves as a contributing editor to Salamander and teaches in the School of Interdisciplinary Arts at Hampshire College. She lives in Chesterfield, NH, with her husband, their infant son, two dogs, and a tomcat named Fergus. Becka Mara McKay directs the MFA in Creative Writing at Florida Atlantic University. Publications include a book of poetry: A Meteorologist in the Promised Land (Shearsman, 2010) and three translations of Israeli fiction: Laundry (Autumn Hill, 2008), Blue Has No South (Clockroot, 2010), Lunar Savings Time (Clockroot, 2011). Her chapbook of prose poems, Happiness Is the New Bedtime, was just published by Slash Pine Press. David Meischen writes poetry, short fiction, and memoir. His work has appeared in Copper Nickel, The Gettysburg Review, The Southern Review, Southern Poetry Review, Bellingham Review, Valparaiso Fiction Review, and elsewhere. Meischen is a co-founder and Managing Editor of Dos Gatos Press; he lives in Albuquerque, NM, with his husband—also his co-publisher and co-editor—Scott Wiggerman. Mario Meléndez (Linares, 1971) studied Journalism at La República University of Santiago, Chile. Figured among his books are: Autocultura y juicio, Apuntes para una leyenda, and Vuelo subterráneo. In 1993, he received the Municipal Prize of Literature in the Bicentennial of Linares. His poems have appeared in different magazines of Latino-American literature and in national and foreign anthologies. Matt W. Miller was born and raised in Lowell, Massachusetts. He is the author of Club Icarus, winner of the 2012 Vassar Miller Poetry Prize, and Cameo Diner: Poems. The recipient of a Wallace Stegner Poetry Fellowship from Stanford University and a Walter E. Dakin Poetry Fellowship from the Sewanee Writers’ Conference, he teaches and coaches at Phillips Exeter Academy. Ellene Glenn Moore is an MFA candidate and Knight Fellow in Poetry at Florida International University. Her work has appeared or is forthcoming in Caliban, Brevity, Best New Poets, Spillway, Ninth Letter Online, Bayou, and elsewhere. Doireann Ní Ghríofa is an award-winning bilingual poet, writing both in Irish Gaelic and in English. Paula Meehan awarded her the Ireland Chair of Poetry Bursary 2015. Her collection Clasp is currently shortlisted for the Irish Times Poetry Award 2016. Billy O'Callaghan's third collection, The Things We Lose, the Things We Leave Behind, won the 2013 Irish Book Award. He has published in the Bellevue Literary Review, Confrontation, the Fiddlehead, Hayden's Ferry Review, Kenyon Review, Kyoto Journal, London Magazine, Los Angeles Review, Narrative Magazine, Southeast Review, and many other magazines around the world. Charles Rafferty's tenth book of poetry is The Unleashable Dog (2014, Steel Toe Books). His poems have appeared in The New Yorker, Oprah Magazine, The Southern Review, and Prairie Schooner. New work is forthcoming in Ploughshares and Plume. Currently, he directs the MFA program at Albertus Magnus College. Christa Romanosky grew up in northern Appalachia. She received her MFA from the University of Virginia, and Bachelor of Science from Carnegie Mellon University. Her poetry can be found in The Kenyon Review, EPOCH Magazine, Columbia Poetry Review, North American Review, and elsewhere. Her fiction is published in the Kenyon Review Online, Cincinnati Review, WITNESS Magazine, Crazyhorse, and elsewhere. Brian Simoneau is the author of River Bound (C&R Press, 2014). His poems have appeared in Boulevard, Crab Orchard Review, The Georgia Review, Mid-American Review, RHINO, and other journals. He lives in Connecticut with his family. Joseph Spece is founding editor at SPR and the SHARKPACK Annual, and maintains a speculative column on animal being at Noble / Gas Qtrly. His first book of poems is Roads. When she isn’t interviewing scientists and writing about their work for the University of Washington, Heidi Stahl writes poetry near the water and teaches creative writing to adults and kids. Her poems have appeared in Off the Coast and are forthcoming in Cape Cod Poetry Review. Eleanor Stanford is the author of two books of poems, Bartram's Garden and The Book of Sleep. Her poems and essays have appeared in Ploughshares, The Harvard Review, The Kenyon Review, and many others. She lives in Philadelphia, and is a 2014/2016 Fulbright scholar to Brazil where she is researching and writing about rural midwifery. Katie Sticca, who received her MFA in fiction from Emerson College, is managing editor at Salamander. Angela Voras-Hills earned her MFA at UMass-Boston and has been awarded grants from The Sustainable Arts Foundation, the Key West Literary Seminar, and was a fellow at the Writers' Room of Boston. Other work has appeared in Kenyon Review Online, Memorious, Hayden's Ferry Review, and Best New Poets, among other journals and anthologies. She currently lives in Madison, WI, where she's Literary Arts Program Co-director for Arts + Literature Laboratory. Will Walker lives in San Francisco with his wife and their dog. He is a former editor of the Haight Ashbury Literary Journal and has a book of poetry (winner of the 2008 Blue Light Book Award), titled Wednesday after Lunch. He's working on a new book called Zeus at Twilight. Gary J. Whitehead’s third collection, A Glossary of Chickens, was published by Princeton University Press in 2013. His writing awards include, among others, a New York Foundation for the Arts Fellowship, the Pearl Hogrefe Fellowship at Iowa State University, and the PEN Northwest Margery Davis Boyden Wilderness Writing Residency Award. His poems have appeared widely, most notably in The New Yorker. Lori Wilson is the author of the poetry collection, House Where a Woman (Autumn House Press, 2009). A graduate of Drew University’s MFA Program in Poetry, she lives in Morgantown, West Virginia, where she works as a software developer and teaches a satellite Madwomen in the Attic poetry workshop. Emma Winsor Wood is a Teaching-Writing Fellow at the Iowa Writers’ Workshop. She has poems published or forthcoming in DIAGRAM, The Journal, Bat City Review, The Seattle Review, BOAAT, and The Collagist, among others. She grew up in New York City and also writes essays.